On 29th January 2018, the Band of the Brigade of Gurkhas flew to Nepal to provide musical support for various UK Defence Engagement activity. We hear from one of the newest and youngest members of the band about the trip, Musician Jhanak Dhungana who only joined the band at the end of 2017. The Band led by the Director of Music (DOM), Major Tony Adams and the Assistant Director of Music (ADOM), Captain Basu Dev Gurung were also accompanied by pipers from 2 Royal Gurkha Rifles, Pipe Major Hem Karna Rai and Corporal Hemraj Rai, Pipe Major Saroj Gurung and Corporal Raman Rai from the Queen’s Own Gurkha Logistic Regiment. The band has visited Nepal many times in the past but being the newest member of the band (Intake 2017) it was for me and my three numbaries our first visit since joining the British Army and leaving Nepal. After checking in all our instruments, uniforms and luggage eventually we were ready to board the plane. After a 13 hour of flight we arrived at Tribhuwan International Airport, Kathmandu, Nepal. After collecting all our instruments and luggage, we went to the British Gurkha Kathmandu camp, where we stayed throughout our tour. From 1st February we were back with our musical hats on. It was nearly a week since the musicians had seen their instruments therefore we needed to practice to bring our musical standards back to the required levels expected of a British Army military band. Daily from 3rd to 6th February, we travelled to Singh Darbar, the Nepalese Army Officers Club and Tudikhel for musical and marching rehearsals with the Nepalese Army Band. On 7th February, we traveled to British Gurkha Pokhara for the Attestation parade for new Gurkha recruits of Intake 2018. Next morning, we gave those new recruits an experience of marching to a bass drum beat around the camp. The 9th February was a huge day for Intake 2018. There were hundreds of family members who came to see their sons at the Attestation parade before they bid goodbye to them as they make their journey to the UK to start their basic training. It was like a flash back for me and my numbaries who were in the same position just a year ago. It was good to be back there again. In the evening our band performed a sounding of retreat for Intake 2018, for staff and guests of the Brigade of Gurkhas Pokhara. 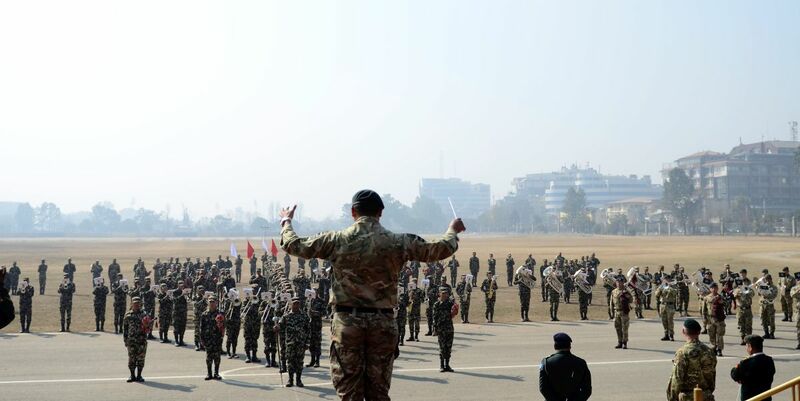 On the 11th and 13th February, the band was engaged in the Shivaratri program at Tudikhel collaborating with the Nepalese Army Band and an Indian Army Band. This was a celebration for the Nepalese Army which they celebrate every year in style where hundreds of personnel participate with many VIPs present, including the President and Prime Minister of Nepal. It was a pleasure to see our Director of Music and Assistant Director of Music presented with a gift from Nepal’s first female President Mrs Bidhya Devi Vandari on behalf of Nepal. We also took part in a joint concert with the Nepalese and Indian Army Bands at the Nepalese Army Officers Club, which was very successful and enjoyable. On 16th February, we travelled to a British school to give a short musical display for the students and staff. We could see our young audience were very pleased with our slick display and made them smile with our cornet section’s funny act in “The Huntsman”. We let our young audience participate with the band in our Brigade march “Yo Nepali”. 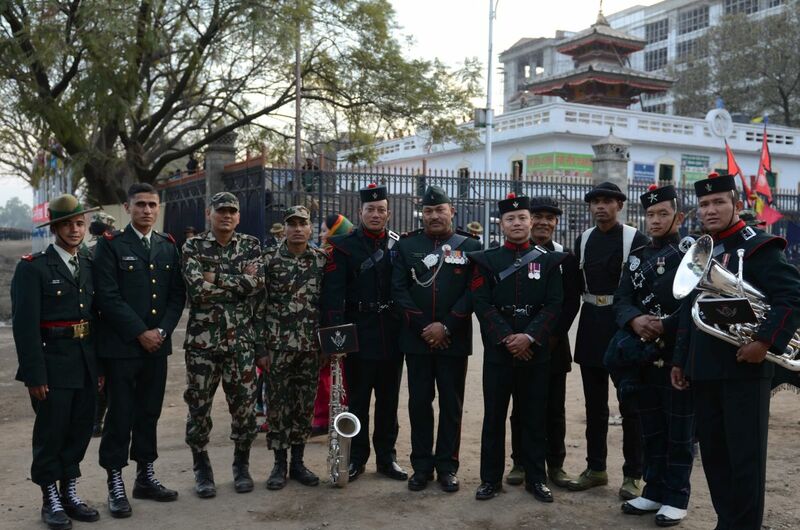 On the evening of 21st February, the band performed a “Sounding of Retreat” at the British Embassy, Nepal. The sleek display by the band and flawless act of our Khukuri dancers amazed the audience from start to finish. The Ambassador himself came personally to express his gratitude to all the members of the Band of the Brigade of Gurkhas. On 22nd of February, our brass quintet did the final engagement of the tour at the Officer’s Mess, Kathmandu. Finally after biding a farewell to family and friends we flew back to the UK on 5th March 2018.